Probing intelligence is not what made Sanjib Das Apu pick up on the subject of disaster, his emotional attachment to his reality did. "Accidents don't fascinate me as subjects. However, we live in a time when we are constantly being troubled by the thought that at every corner there is a disaster waiting to happen," says the artist. 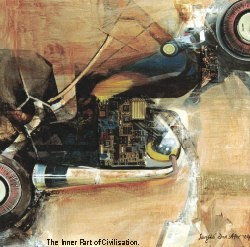 His attitude towards Modern civilisation has brought into existence a series of works that the artist called "The Inner Parts of Civilisation." In front of one such painting at the Zainul Gallery, where Sanjib's second solo just wrapped up a course of seven days starting from March 18, one of his artist friends contemplated the possibilities of his genre. By drawing on the subject of technology and how it is impacting us, Sanjib may have the chance to turn a corner, he observed. Sanjib has successfully proven his acumen through quite a few works in expressing artistic emotion about his chosen subject matter -- the fear of unfettered technological advances. But one must admit by looking at his works that he is here to show the truth, not to raise an alarm. In these works, the incorporation of machine parts, circuit boards or the painted exhaust pipe of a motorbike, are not mere elements to strike a compositional balance. They serve a purpose; they help the artist express a sense of foreboding. But they also communicate something more than that. As fear never takes the centre stage in Sanjib's oeuvre, they serve as indications of the subject he examines -- the dominance of machines and the impending chaos they throw us into. Sanjib's visual propositions are also about retinal pleasure. As most paintings attempt to raise questions about the purpose of the machines, or how it is leading us to an uncertain future, there are some works that are almost pretty. In this huge solo, which takes up both the gallery of the Institute of Fine Arts, there are some landscape-like works that compromise the main theme. They are representative of a different motivation: to cater to the popular taste. "The exhibition brings together works of the last eight years -- I wanted to show how my works have changed over the years," says Sanjib. After surveying the paintings dispersed in two exhibition halls, one can only say that it has changed for better. In recent years, as his paintings reveal, Sanjib has dealt with disaster circumstances with a bold painterly attitude. 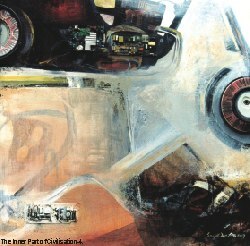 His sweeping brush works lend his paintings the life that is absent in machine parts. And the spaces that hem in the drawn or pasted elements accentuate his theme of disaster and its traumatic impact on the human psyche. Sanjib has revealed a hauntingly psychic side of him self. 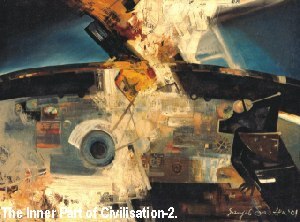 In the painting "Inner Parts of Civilisation-2" he has depicted a cockpit of an aeroplane about to crash. Sweeping brush strokes cut through the middle hinting at the explosion that is about to take place. This he drew in 2001, before 9/11, forecasting the attack. There are some nostalgia-driven images that simply did not work. These paintings neither have the bold contour nor the attitude that he invested in his other works. Sanjib must chart out the ground he feels most comfortable trudging.